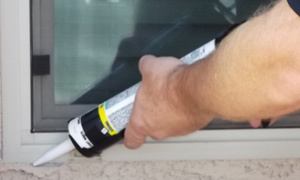 Caulk is a flexible material used to seal gaps and joints in buildings and other structures to make them watertight or airtight. PCBs were a common additive to caulk because of their water and chemical resistance, durability and elasticity. PCB infused caulking was used to seal joints between masonry and around windows, doors and other areas. 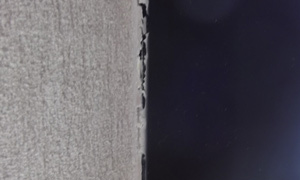 Caulk containing PCBs was used in some buildings, including schools, primarily between 1950 and 1980. PCBs were also used in other building materials such as paints, mastics, sealants, adhesives, specialty coatings and fluorescent light ballasts. These PCBs persist in old building materials and can contaminate surfaces, dust, soils and the indoor air quality (IAQ). In 2009, the U.S. Environmental Protection Agency (EPA) announced new guidance for school administrators and building managers with important information about managing PCBs in caulk. According to the EPA, PCBs have been shown to cause cancer and numerous other serious health effects in animals. These include issues with the immune system, reproductive system, nervous system, endocrine system and other negative health effects. Exposure to PCBs in buildings can occur by directly touching PCB-containing caulk and surrounding building materials or soil, hand to mouth contact after touching PCB-containing caulk and surrounding building materials or soil, and breathing in air or dust contaminated with PCBs. The EPA recommends testing for PCBs in peeling, brittle, cracking or deteriorating caulk in buildings, especially in schools environments. Even caulk that appears in good condition may be a source of PCBs. The EPA also recommends that building owners and facility managers consider testing to determine if PCB levels in the air exceed the EPA's suggested public health levels. For those concerned about PCBs, EMSL Analytical offers a complete array of testing services and sampling supplies. 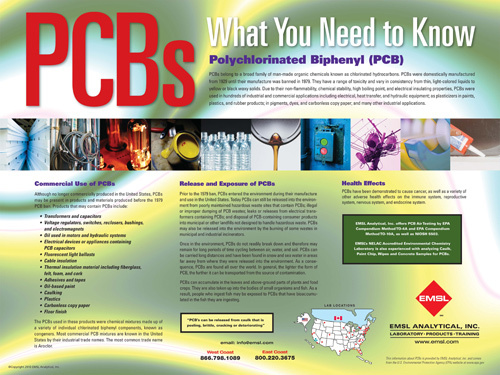 To request your complimentary PCB poster, please call 1-888-958-8170.